Falling in love is a beautiful thing. Unless you fall for the wrong person. Finally settled after a tragedy-laden life, 24-year-old Caleb has found security in his faith, his friends, and his career. It’s the life he’s always wanted—simple, predictable, and safe. Enter Kate Hawkins, the attractive 21-year-old stranger he rescues from a bar fight who has an odd affinity for the color pink and a unique sense of humor. It doesn’t take long to realize their connection is intense, but after only a handful of dates, a shocking revelation surfaces. Lines are drawn, sides are taken, and loyalties are decided as their newfound relationship is brought to a sudden halt. But unlike most couples who split, avoiding each other is impossible. As daily interactions become unbearable, one realization becomes clear: they’ve both fallen hard for the absolute wrong person, which leaves both scrambling for a way to make it right. I’ve read a book by Amy Matayo before. And it was good, and I was planning to one day getting around to reading her other novel. 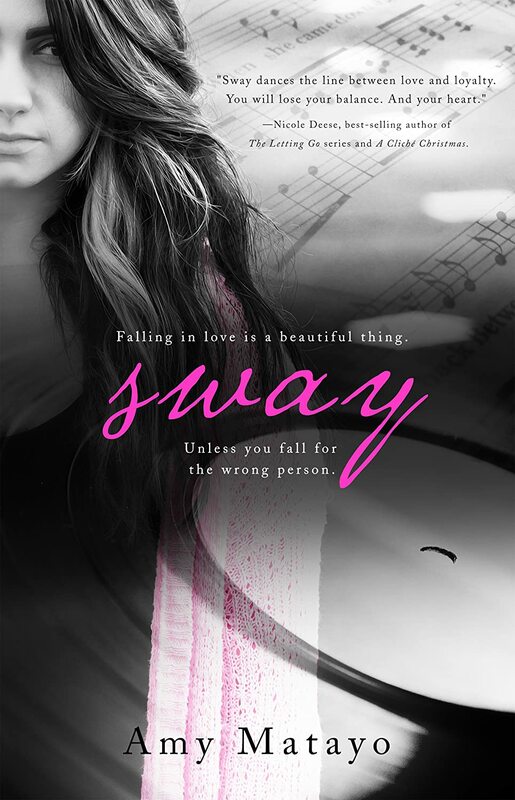 Then Sway came out and it started making rounds as a must read. Clearly, it took me a while to get to reading it, but let me tell you this, I enjoyed this book so much I’ll read anything Amy Matayo writes now. The plot. For me, I went into this book blind. I didn’t read any reviews, except for that I heard it was great. And let me tell you going into this book blind was perfect because when I figured out the “catch” I was really surprised. And amazed. And I totally loved the idea (so I’m going to try to review this book very very vaguely). The romance. So this was one of those times where the couple starts to fall for each other early in the book, and it worked. Even though it began so soon, the author really laid the foundation for their relationship and I loved the back and forth banter that Caleb and Katie had. Their romance was just so sweet. And even after the “revelation” occurs, you could see just how drawn they are to each other. I just really enjoyed being in their moments. Spiritually, I loved the aspect of trusting God (for one character) and getting to know God (for the other character). I also liked that the author showed what walking by faith looks like in reality. How to say this without giving something away…it’s not what I didn’t like, but I did think that someone in the novel had a position that they might have been too young for. That is all. I just loved it. It was everything everyone said it was and I can’t wait for what comes next! Sounds like you really enjoyed it! Will have to check it out as I was hesitant to pick it up!